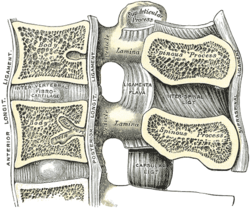 A thoracic vertebra. 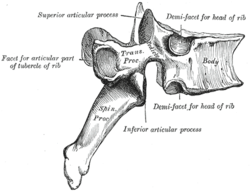 The facet joint is the joint between the inferior articular process (labeled at bottom) and the superior articular process (labeled at top) of the subsequent vertebra. 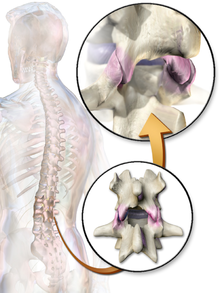 The biomechanical function of each pair of facet joints is to guide and limit movement of the spinal motion segment. In the lumbar spine, for example, the facet joints function to protect the motion segment from anterior shear forces, excessive rotation and flexion. Facet joints appear to have little influence on the range of side bending (lateral flexion). These functions can be disrupted by degeneration, dislocation, fracture, injury, instability from trauma, osteoarthritis, and surgery. In the thoracic spine the facet joints function to restrain the amount of flexion and anterior translation of the corresponding vertebral segment and function to facilitate rotation. Cavitation of the synovial fluid within the facet joints is responsible for the popping sound (crepitus) associated with manual spinal manipulation, commonly referred to as "cracking the back." In large part due to the mechanical nature of their function, all joints undergo degenerative changes with the wear and tear of age. This is particularly true for joints in the spine, and the facet joint in particular. This is commonly known as facet joint arthritis or facet arthropathy. Facet joint arthritis often manifests as a dull ache across the back. However like many deep organs of the body it can be experienced by the patient in a variety of referral pain patterns. The location of facet joints, deep in the back and covered with large tracts of paraspinal muscles, further complicate the diagnostic approach. Typically facet joint arthritis is diagnosed with specialized physical examination by specialist physicians. Advanced imaging such as MRI or CT may be necessary to confirm the diagnosis and to rule out other conditions. Conservative treatment of facet joint arthritis involves chiropractic, physical therapy, or osteopathic medicine with correction of posture and biomechanics being the key. More advanced cases involving severe inflammatory response in the Z-joint, not unlike a swollen arthritic knee. 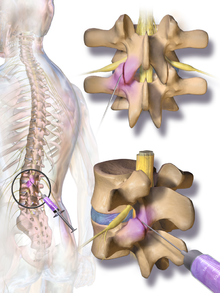 Steroid injections may provide temporary pain relief. This is typically performed under image guidance to ensure accuracy given the complex shape and deep location of the facet. This page was last edited on 27 November 2018, at 04:11 (UTC).